Testifying before the US Congress back in 2010, I refused to endorse the view that a first large calving at Petermann Gletscher in North Greenland was caused by global warming. Additional events and analyses of new data and old data, however, convinced me that climate change forces Petermann Gletscher into a new and unknown state. Ocean data from 810 meters below sea level under one of Greenland’s last remaining ice shelves arrives every 3 hours at my laptop via a 3-conductor copper cable that passes through 100 meter thick ice to connect to a weather station that via a satellite phone system connects to the rest of the world. This Ocean-Weather station on the floating section of Petermann Gletscher has reported for 400 days today. I am still amazed, stunned, and in awe that this works. Top section of the University of Delaware weather station on Petermann Gletscher on 27 August 2016. View is to the north-east. Cabled ocean observatory linked to a University of Delaware weather station on Petermann Gletscher, Greenland on 28 August 2016. View is to the north. Battery voltage at the Petermann Ocean-Weather Station from Aug.-20, 2015 through Sept.-23, 2016. 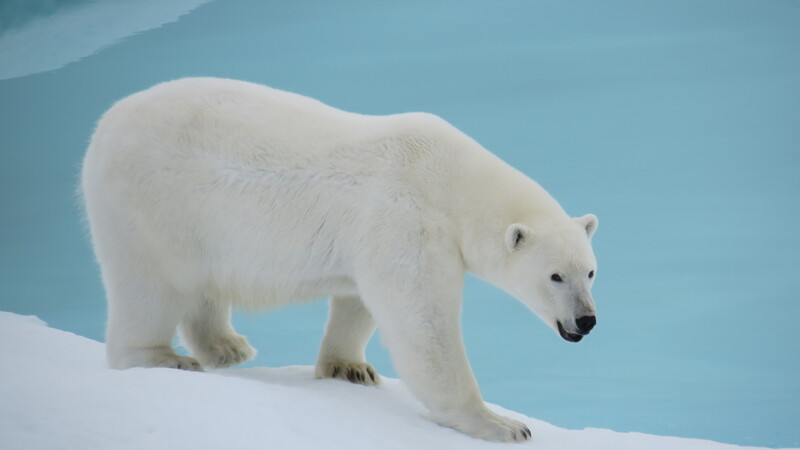 The polar night is indicated by slowly declining voltage near 12 V while during the polar day voltage is near 14 V with oscillations in spring and fall during the transition from 24 hours of darkness to 24 hours of sun light. There is an unexplained outage without data from February 12-25 (Day 175-189) which happened a day after the first data logger shut down completely without ever recovering. Our station has 2 data loggers: A primary unit controls 2 ocean sensors, atmospheric sensors, and the Iridium satellite communication. 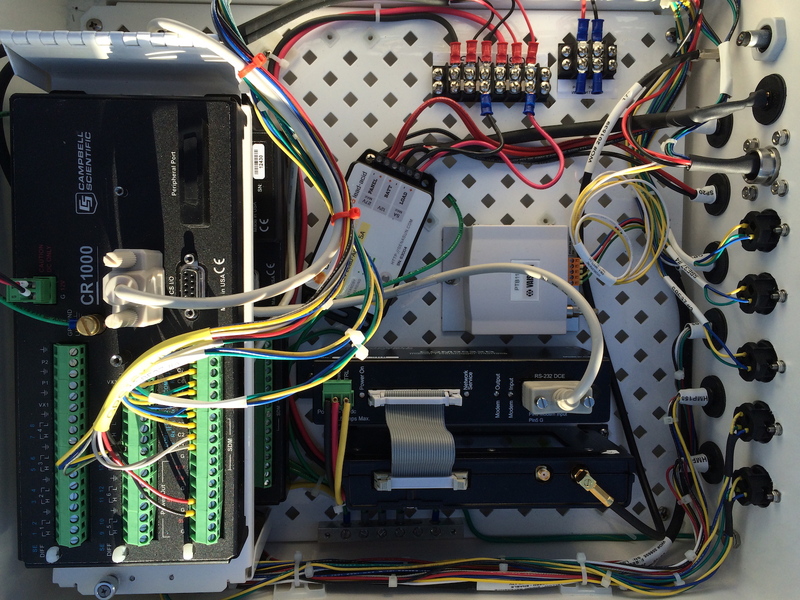 The secondary unit controls 3 ocean sensors and the GPS that records the moving glacier. Remote access to the secondary logger is via the primary, however, each logger has its own processors, computer code, and back-up memory card. Inside of University of Delaware command and control of five ocean sensors and surface weather station. 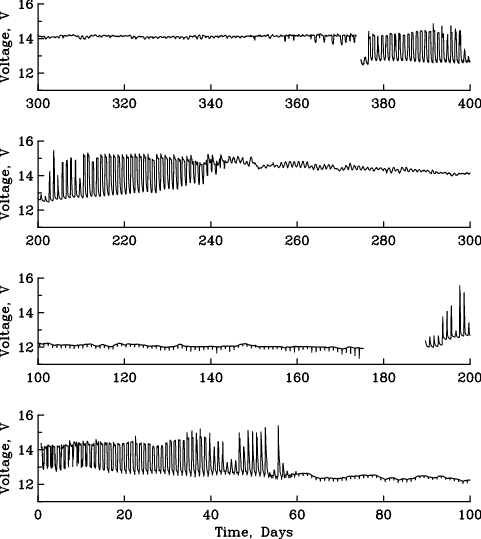 Two data loggers are stacked above each other on the left. Lets hope that the station will keep going like as it does now. The major discovery we made with the ocean data are large and pronounced pulses of fresher and colder melt waters that swosh past our sensors about 5 and 25 meters under the glacier ice. 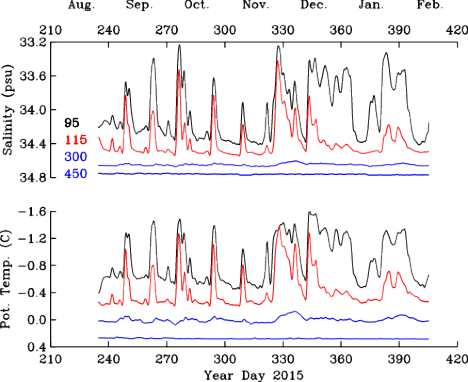 These pulses arrive about every 14 days and this time period provides a clue on what may cause them – tides. 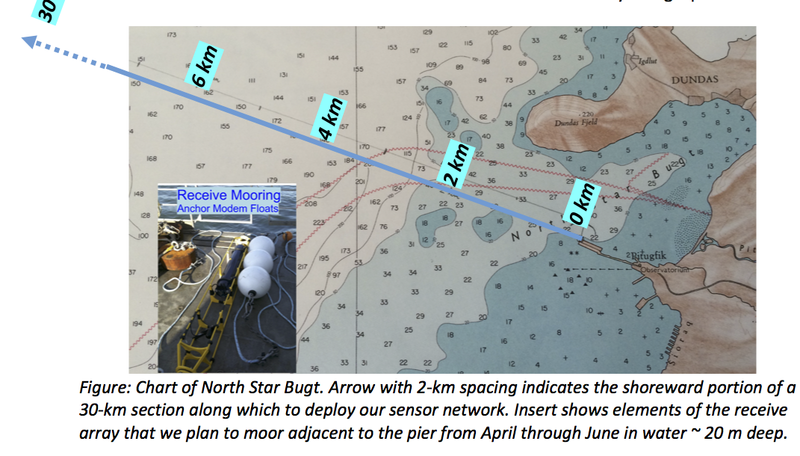 A first descriptive report will appear in December in the peer-reviewed journal Oceanography. Our deeper sensors also record increasingly warmer waters, that is, we now see warm (and salty) waters under the glacier that in 2015 we saw more than 100 km to the west in Nares Strait. This suggests that the ocean under the glacier is strongly coupled to the ambient ocean outside the fjord and vice versa. More on this in a separate future posting. P.S. : The installation and year-1 analyses were supported by a grants from NASA and the Jet Propulsion Laboratory, respectively, while the current work is supported by NSF for the next 3 years. Views and opinions are mine and do not reflect those of the funding agencies. Where to land a plane in North Greenland? This remote wilderness has the last floating ice shelves in the northern hemisphere such as Petermann Gletscher. Two weeks ago Dr. Keith Nicholls of the British Antarctic Service (BAS) and I visited this glacier to fix both ice penetrating radars and ocean moorings that we had deployed in 2015 after drilling through more than 100 meters of glacier ice. The BAS radars measure how the ice thins and thickens during the year while my moorings measure ocean properties that may cause some of the melting. Keith and I are thinking how we can design an experiment that will reveal the physics of ocean-glacier interactions by applying what we have learnt the last 12 months. First, however, we need to figure out where to land a plane to build a base camp and fuel station in the wilderness. I searched scientific, military, and industry sources to find places where planes have landed near Petermann Gletscher. The first landing, it seems, was a crash landing of an US B-29 bomber on 21 February 1947 at the so-called Kee Bird site. All 11 crew survived, the plane is still there even though it burnt after a 1994/95 restoration effort that got to the site in a 1962 Caribou plane landing on soft ground with a bulldozer aboard that is still there also. A Kee Bird forum contains 2014 photos and, most importantly for my purpose, a map. Names of glaciers, capes, islands in Petermann Region over MODIS of Aug.-21, 2012. 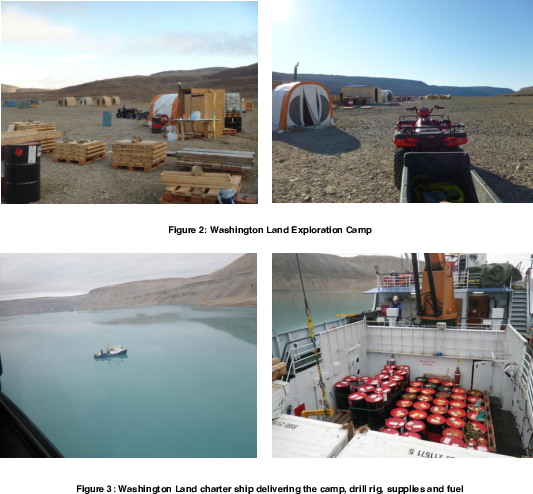 The Avannaa camp of 2013 and 2014 was supplied from a more southern base camp at Cass Fjord that Avannaa Logistics and/or another mineral company, Ironbark.gl apparently reached via a chartered ship. Cass Fjord Base Camp on southern Washington Land and Kane Basin. 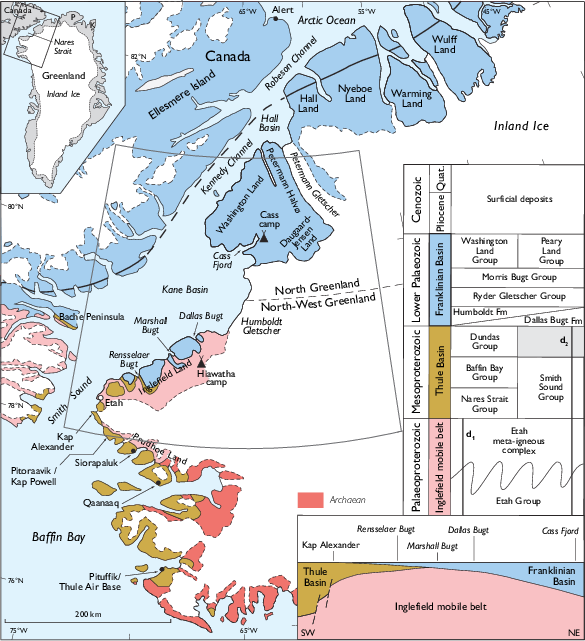 Credit: IronBark Inc.
Dawes (2004): “Simplified geological map of the Nares Strait region …” from Thule Air Force Base in the south to the Arctic Ocean in the north with Petermann Gletscher in the center of the top half. If we do plan future activities at Petermann Gletscher and/or Washington Land and/or areas to the north, then I feel that the Avannaa site may serve as a good semi-permanent base of operation for several years. It is here that Ken Borek Twin Otter landed several times. It is reachable with single-engine AS-350 helicopters that could be stationed there during the summer with a fuel depot to support field work on the ice shelf of Petermann Gletscher and the land that surrounds it. 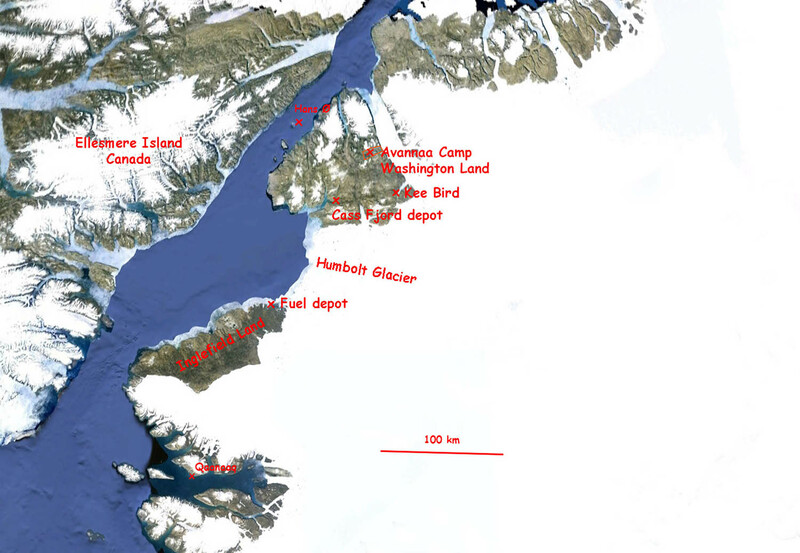 The established Cass Fjord Base Camp to the south would serve as the staging area for this Petermann Camp which has both a short landing strip suitable for Twin Otter and potential access from the ocean via a ship. 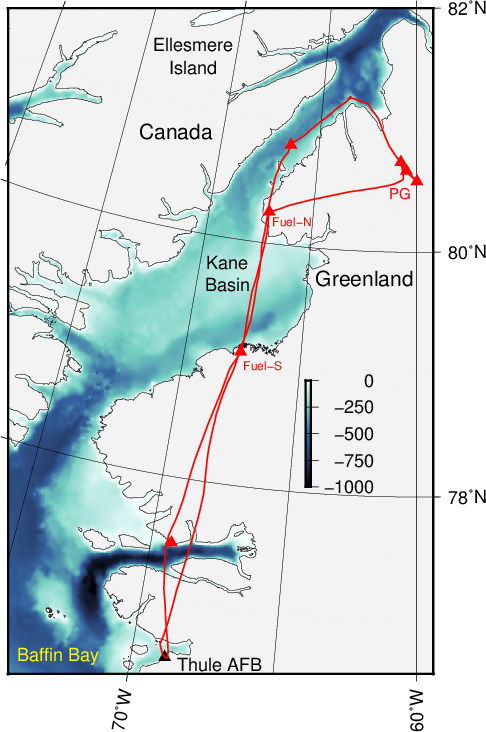 Access by sea may vary from year to year, though, because navigation depends on the time that a regular ice arch between Ellesmere Island and Greenland near 79 N latitude breaks apart. There are years such as 2015, that sea ice denies access to Kane Basin to all ships except exceptionally strong icebreakers such as the Swedish I/B Oden or the Canadian CCGS Henry Larsen. In lighter ice years such as 2009, 2010, and 2012 access with regular or ice-strengthened ships is possible as demonstrated by the Arctic Sunrise and Danish Naval Patrol boats. 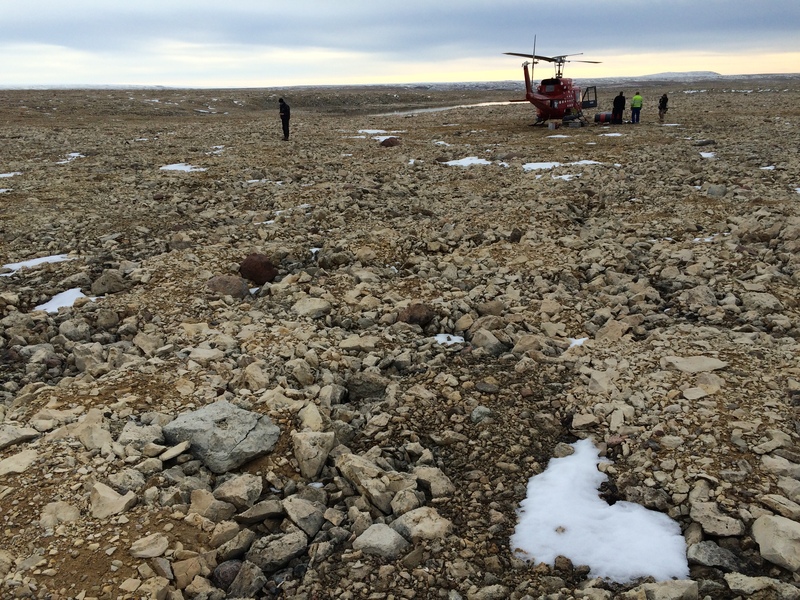 International collaboration is key to leverage multiple activities and expensive logistics by land, air, or sea in this remote area of Greenland. Standing on floating Petermann Gletscher last sunday, I called my PhD student Peter Washam out of bed at 5 am via our emergency Iridium phone to check the machine that Keith Nicholls and I had just repaired. 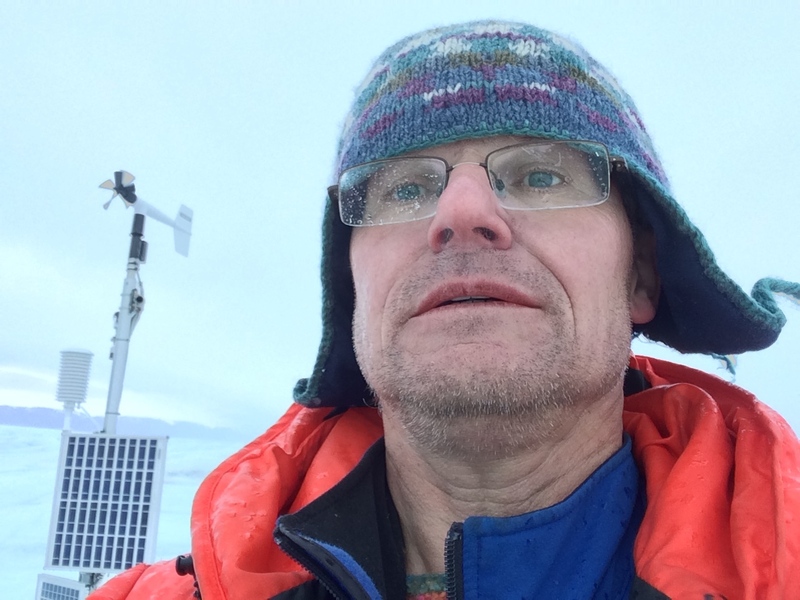 We had prepared for this 4 months and quickly established that a computer in Delaware could “talk” to a computer in Greenland to receive data from the ocean 800 m below my feet on a slippery glacier. For comparison the Empire State Building is 480 m high. The closest bar was 5 hours away by helicopter at Thule Air Force Base from where Keith and I had come. 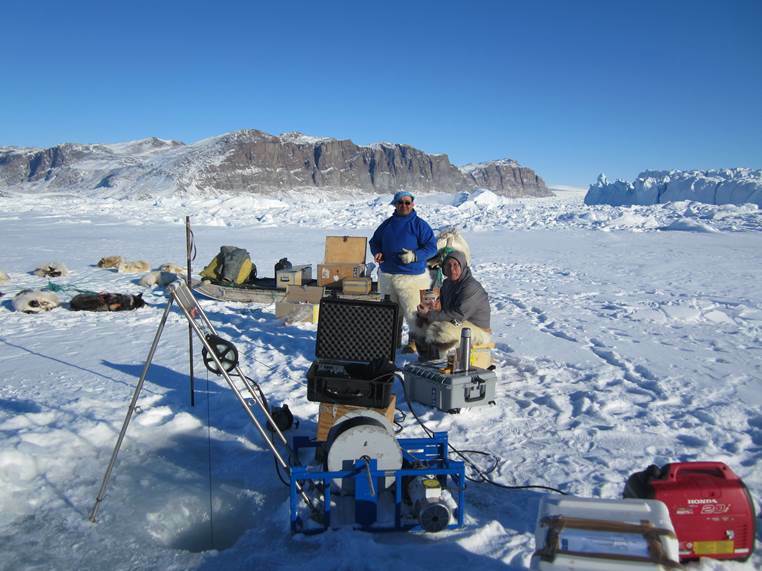 Refurbished ocean observatory linked via cables to a University of Delaware weather station on Petermann Gletscher, Greenland on 28 August 2016. View is to the north. Refueling stop on southern Washington Land on 27 August 2016. Air Greenland Bell-212 helicopter in the background, view is to the south towards Kane Basin. Helicopter flight path on 27/28 August 2016 to reach Petermann Gletscher (PG) via southern (Fuel-S) and northern (Fuel-N) fuel stops in northern Inglefield and southern Washington Land, respectively. Background color is ocean bottom depth in meters. Upon arrival at the first (northern-most) Peterman Gletscher (PG) station we quickly confirmed our earlier suspicion that vertical motion within the 100 m thick glacier ice had ruptured the cables connecting two ocean sensors below the ice to data loggers above. We quickly disassembled the station and moved on to our central station that failed to communicate with us since 11 February 2016. Keith predicted that here, too, internal glacier motions would have stretched the cables inside the ice to their breaking point, however, this was not to be the case. University of Delaware weather station on Petermann Gletscher on 27 August 2016. View is to the north-east towards the Greenland ice Sheet, that is, the glacier flows from right to left. Bottom section of the University of Delaware weather station on Petermann Gletscher on 27 August 2016. View is to the north-west towards Nares Strait. 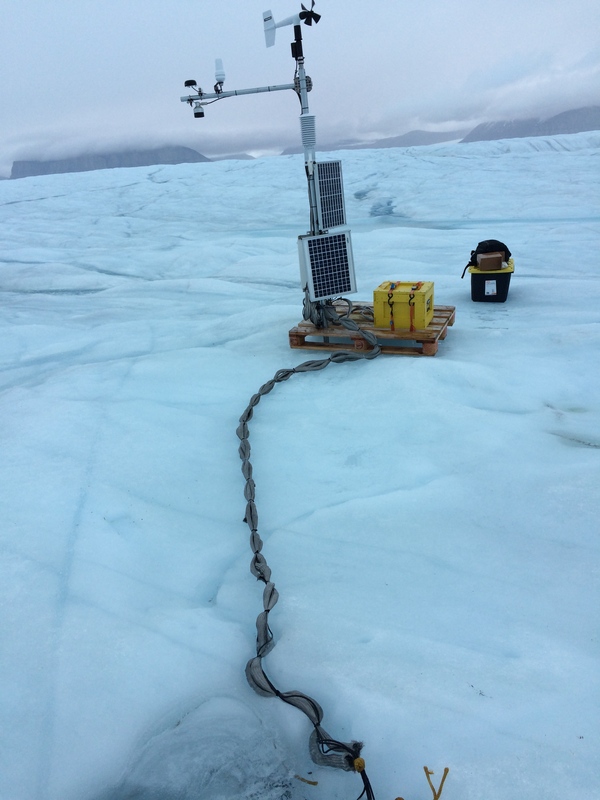 The palette designed to stabilize the station as the glacier melts under it is turned and rests on the 80 lbs yellow battery box that was strapped to the surface of the palette. Looks can be deceiving, however, and we found no damage to any electrical components from the yellow-painted wooden battery box housing two 12 Volt fancy “car batteries” at the bottom to the wind sensor on the top. Backed-up data on a memory card from one of two data loggers (stripped down computers that control power distribution and data collections) indicated that everything was working. The ocean recording from more than 800 meters below our feet was taken only a few minutes prior. In disbelief Keith and I were looking over a full year-long record of ocean temperature, salinity, and pressure as well as glacier motions from a GPS. This made our choices on what to do next very simple: Repair the straggly looking ocean-glacier-weather station, support it with a metal pole drilled 3.5 m into the glacier ice, and refurbish the adjacent radar station. We went to work for a long day and longer night without sleep. Selfie on Petermann Gletscher on sunday 28 August 2016 after 33 hours without sleep. Weather station and northern wall of Petermann in the clouds. It was raining, too. 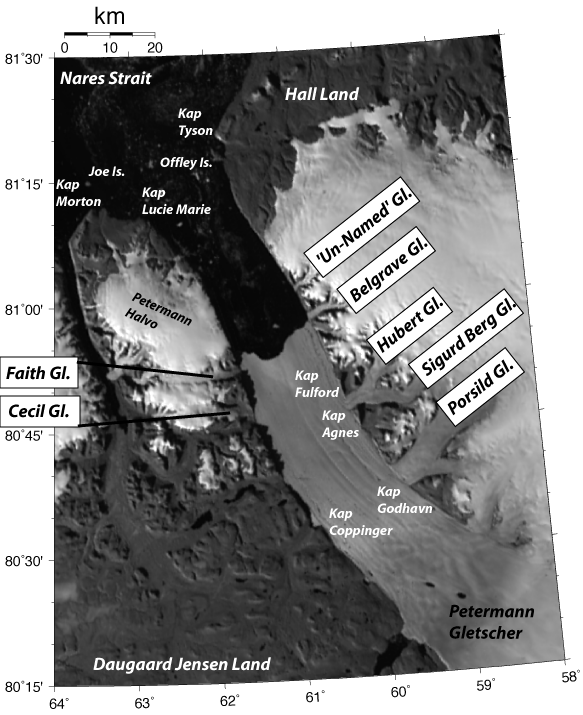 A first peer-reviewed publication on this station and its data until 11 February 2016 will appear in the December 2016 issue of the open-access journal Oceanography with the title The Ice Shelf of Petermann Gletscher, North Greenland and its Connection to the Arctic and Atlantic Oceans.